Tuesday February 27th 1883 Mother still keeps sick and it is just all I can do the work and take care of her the swelling has gone from her thumb up into her elbow and is very painful. We sent for Hatt and Edith to spend the afternoon. 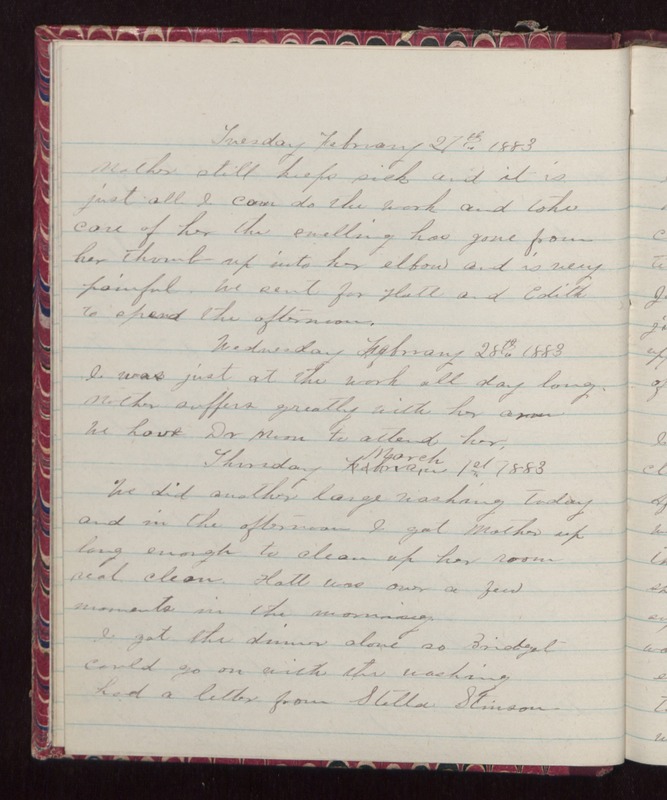 Wednesday February 28th 1883 I was just at the work all day long. Mother suffers greatly with her arm. We have Dr Moon to attend her. Thursday March 1st 1883 We did another large washing today and in the afternoon I got Mother up long enough to clean up her room real clean. Hatt was over a few moments in the morning. I got the dinner alone so Bridget could go on with the washing had a letter from Stella Stinson.